DIME BUILDING DETROIT vintage photo print Dime Bldg Detroit old vintage black and white DIME BUILDING CONSTRUCTION photo print picture for sale. 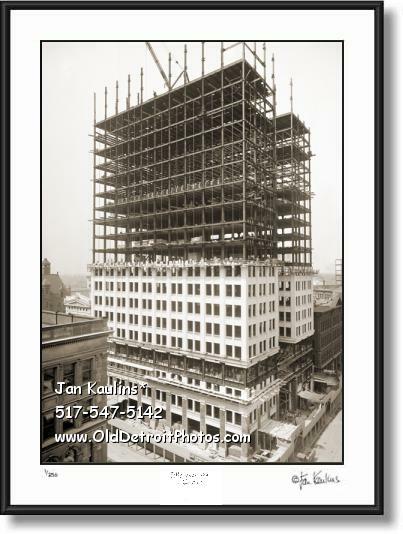 This is a fabulous restored (Ca.1911) Detroit DIME BUILDING photo picture print of the beginnings of construction on this historical Detroit Dime Building in downtown Detroit. It is made from an original 1911 black and white negative that has been meticulously restored and offered for sale here at the Rare and Historical Detroit Photo Gallery for the first time. "The Dime Building is a skyscraper class-A office building located in downtown Detroit, Michigan. It is adjacent to the Penobscot Building in the heart of the Detroit Financial District. The building stands 23 stories tall, with eight elevators, and was constructed between 1910 and 1912. It is used as an office building with retail space on the street level. The tower was designed in the Neo-Classical style by Daniel Burnham. The steel-framed structure is faced with white glazed brick and terra cotta trim. The most distinctive feature is the central light court which begins on the third floor and creates a U-shaped floor plan on the upper office floors."